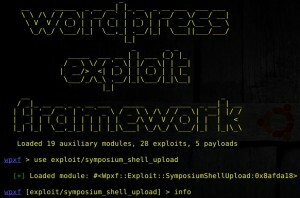 Browse: Home / wordpress exploits framework – wpxf v1.4. 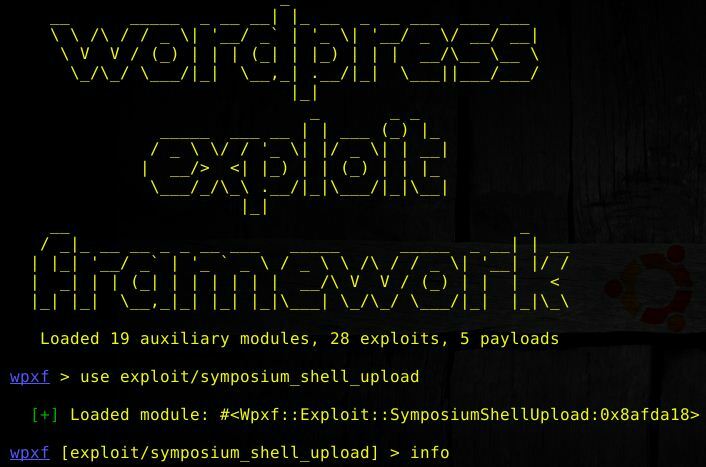 wordpress-exploit-framework is A Ruby framework for developing and using modules which aid in the penetration testing of WordPress powered websites and systems. + bind_php: uploads a script that will bind to a specific port and allow WPXF to establish a remote shell. + custom: uploads and executes a custom PHP script. + download_exec: downloads and runs a remote executable file. + exec: runs a shell command on the remote server and returns the output to the WPXF session. + reverse_tcp: uploads a script that will establish a reverse TCP shell. difference between auxiliary and exploit modules? + Auxiliary modules do not allow you to run payloads on the target machine, but instead allow you to extract information from the target, escalate privileges or provide denial of service functionality. 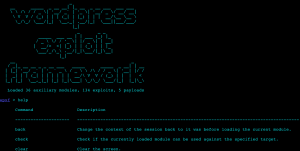 + Exploit modules require you to specify a payload which subsequently gets executed on the target machine, allowing you to run arbitrary code to extract information from the machine, establish a remote shell or anything else that you want to do within the context of the web server. ← WMDFrame – Weapon of Mass Destruction.